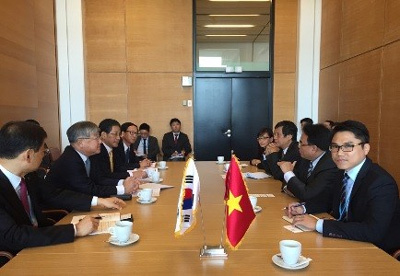 A Memorandum of Understanding (MoU) on radiation and nuclear safety between Vietnam and the Republic of Korea (RoK) was signed in Vienna, Austria on September 15, reported the Ha Noi Moi newspaper. The signing ceremony of the MoU between the Vietnam Agency for Radiation and Nuclear Safety under the Ministry of Science and Technology and the RoK’s Nuclear Security and Safety Commission took place on the sidelines of the 59th General Conference of the International Atomic Energy Agency (IAEA). Under the MoU, the two sides will cooperate in exchanges of information and delegations in the field, focusing on nuclear inspection and nuclear-related item import and export control. The document also focuses the radiation protection, preparations for nuclear breakdown, environment monitoring, and personnel training. Earlier on September 14, a Vietnamese delegation attended the 59th IAEA General Conference. The conference, which runs until September 18, agreed to admit new members - Turkmenistan, Barbados, Antigua and Barbuda./.